I noticed those old feelings of ‘not being enough’ start to creep back in. I noticed myself putting my work ahead of my self-care commitments in the need to be the ‘perfect’ business partner and getting consumed by guilt if I wasn’t working ‘hard enough’. I noticed myself starting to get a bit controlling around my food..having to eat ‘perfectly’ (and giving my partner a hard time when he wasn’t too! Eeekk). I noticed myself really giving myself a hard time when I got cranky at my son, because I wasn’t being the ‘perfect’ mother (even after I had apologised and let him know it was not about him at all). I noticed myself looking for faults in my partner (even though he was being wonderful). I noticed myself not wanting to talk to my girlfriends about what was going on for me. I noticed myself needing to tidy the house more than usual, so it looked ‘perfect’ before I could feel comfortable. This went on for a few days (which is good for me because in the past it could go on for weeks or months without me noticing!). 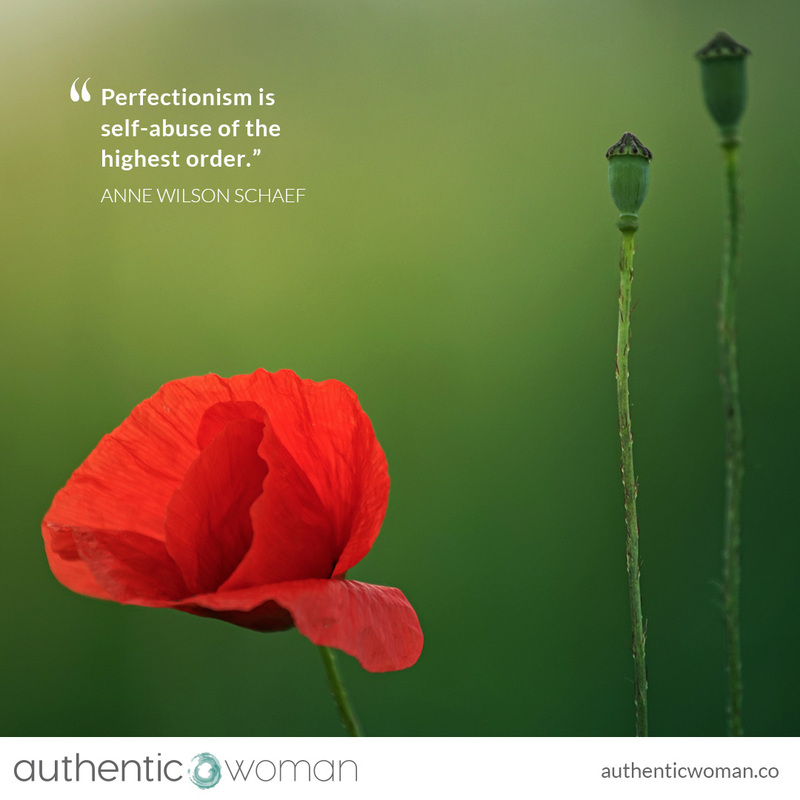 It was actually how I was starting to be with my partner that made me stop and check in with myself, which I feel sad about because as Anne Wilson Schaef says ‘perfectionism is self-abuse of the highest order’ and that was exactly what I was experiencing within myself. I was being really abusive and unforgiving towards myself. The gift these days, is through my ongoing compassionate self-awareness practice I was able to notice what was going on and to finally stop, sit still and ask myself what was really going on. When I go into perfectionism it is always because I have big feelings coming up that I just don’t want to sit with. In this case I had some real financial feel running (which always has me feeling very unsafe) and I was also feeling very hurt – some of it because of something that had happened in the present and some because of some old hurt and betrayal that has been triggered from the past too. Slowly I was able to get really honest and vulnerable with myself and others. I was able to talk to Heather about what was going on for me around work and receive her understanding and love. I was able to share what was going on with me with my girlfriends and with my partner and receive their understanding, support and love. I was able to sit and simply ‘be with’ these really uncomfortable feelings and quite quickly my need to feel and be perfect on the ‘outside’ subsided. I practiced self-compassion rather than self-abuse, which calmed my anxiety, guilt and shame and I was able to sit with the deep hurt and fear that sat under all of these behaviours. Today I can feel the inner freedom that comes from self-compassion, self-care and allowing myself to simply ‘be with’ what is arising for me. Rather than the self-abuse that comes from my perfectionism. Thankfully today I can feel some peace and gratitude again.